This season the styling trend has just begun to get funkier with all the latest bell bottom designs. You heard it right! Bell bottoms are back in the game and going to excite you with the variety of designs being launched with all sorts of tops and shirts. Whether we admit it or not, but bell bottoms do have a unique decent outlook, bringing out the real smartness out of you. Gone are the days when you only used to see plain bottom flared bell bottoms in cotton and silk, today our most eminent designers have taken these to a new level of style. The latest series of bell bottoms crafted are full of decent alluring embellishments, bordered tussles, floral side prints, side embedded motifs, silky shine and laced with net work. Today we will discuss Latest Pakistani Dresses Styles Pairing Bell Bottom Pants. The range of embellished bell bottoms is perfect to pair with your party wear dresses. These are either designed in silk or Jamawar. Either of them is moreover adorned with work of Zari or threadwork in ivory or white. 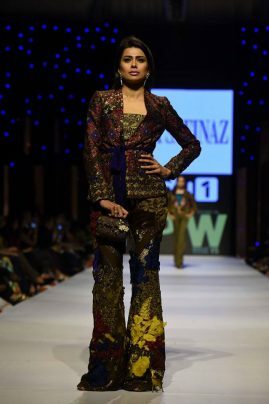 Popular luxury pret collections by Maria b. and Zainab chottani, show the wide range of vibrant colors in bell bottoms. All the embellishments are kept contrasting to the base colors, black over maroon, silver over black, ivory over purple, which indeed look magnificent. The casual pieces of bell bottoms are much more simple and plain in outlook, with little or no embellishment at all. These are crafted in cotton, linen, silk or soft velvet. Some are beautifully printed with prominent floral patterns around the borders and the sides. Some of these comprise of parallel net laces or broad border laces at the bottom ends of the trouser. Crochet laces are also attached in white series of bell bottoms. 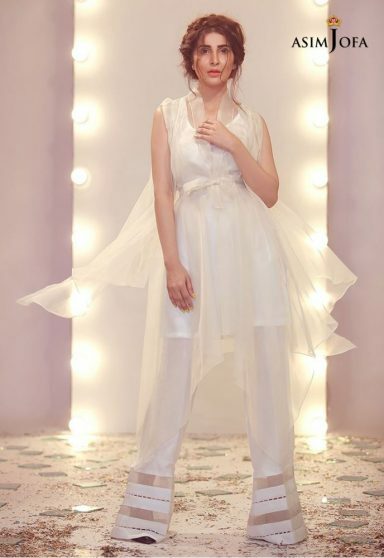 Here is the sneak peak of all the latest cuts and designs of lovely bell bottoms, designed by Pakistan’s Top notch fashion artists. Asim Jofa’s pret collection is full of exciting yet soft hues and designs. Its bell bottoms collection consists of two different varieties. One for formal party wears and the other is somewhat simpler. But all are entirely designed in silk, which looks appealing to sight with any type of top you carry. Sania Maskatiya bell bottoms are unique in their styling, due to the simple touch of pastel shades in white, light brown and faun. These are more fanned at the bottom while around the knee there is a sharp curve which makes these look smarter. Maria B bell bottoms collection is full of richness in terms of designs, the entire collection carries adornments, printed flowers and lace work. Like always, Zainab Chottani fine fashion sense reflects well through her latest bell bottom designs. These have certain royal and regal touch in terms of their embellishments. Latest Pakistani Dresses Styles Pairing Bell Bottom Pants by Sana Safinaz’s is full of bold hues and designs. On one hand, you can see soft golden work over white base while on the other there are heavy golden embellishments seen over a combination of black and dark blue.